Jacob Corwell Obituary - Shippensburg, Pennsylvania | Fogelsanger - Bricker Funeral Home, Inc.
Jacob R. “Jake” Corwell, 82, passed away Sunday, December 24, 2017 at the Shippensburg Health Care Center. Born Thursday, May 2, 1935 in Chambersburg, he was a son of the late James and Anna Mowen Corwell. He was raised by Paul & Freda Nye and Robert Corwell. He was a 1954 graduate of the Chambersburg Area Senior High School, and attended the Shippensburg University for three years. Jake worked as a milk man at the former Dairy Maid, was owner of the former National Distribution and the Big Train, all in Chambersburg. He was the owner and operator of the Cottage Restaurant and Tavern in Chambersburg for 18 years, and after selling, he worked as a sales Rep. for Miller Brewing Company in York, retiring in 2002. Jake was a lifelong member of the Roxbury United Methodist Church and was a Charter member of the Lurgan Township Lions Club. 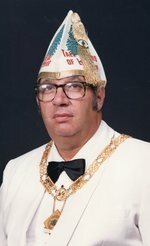 He was a member of the Orrstown Lodge # 262 F. & A.M., Harrisburg Consistory, Valley Forest #145 Tall Cedars of Lebanon, and he served as Supreme Tall Cedar of North America in 1989, and National Vice President for the Muscular Dystrophy Association. Jake was the Lurgan Youth League Director, and a past president and coach. He was a Philadelphia sports fan and a former Penn State season ticket holder. He enjoyed attending his grandchildren’s sporting events. Jake was inducted into the South Central Pennsylvania Sports Hall of Fame in 1983. He is survived by his wife of 62 years, Patricia A. “Patsy” Swartz Corwell, whom he married June 25, 1955 in the Roxbury United Methodist Church; two daughters, Barbara L. Davis, Roxbury, and Beth A. (husband Randall) Alleman, Shippensburg; one son, Brian J. (wife Anne) Corwell, Chambersburg; six grandchildren, Leanne M. (husband Brian) Zoeller, Chambersburg, Cody A. (wife Lisa) Laman, Shippensburg, Retired Pvt. Megan N. (husband Travis, Jr.) Ocker, Newburg, and Jessa E., Jacob H., and Joseph R., Corwell, all of Chambersburg; five great grandchildren, Brantley and Emersyn Laman, of Shippensburg, Sophia Zoeller, Chambersburg, Travis Ocker III, and Charlotte Ocker, both of Newburg; one brother, Richard (wife Gail) Corwell, East Waterford; and several half- brothers and sisters. A Masonic service conducted by the Orrstown Lodge # 262 F. & A.M. will begin at 2:30 p.m. on Saturday, January 6, 2018, in the Fogelsanger-Bricker Funeral Home & Crematorium, Inc. A celebration of life service will follow with the Rev. Dr. Ronald S. McElwee and the Rev. Peter M. Beddia officiating. Burial will be in Parklawns Memorial Gardens at a later date. There will be no viewing or visitation. In lieu of flowers, memorial contributions may be made to the Roxbury United Methodist Church, P. O. Box 101 Roxbury Road, Roxbury, PA 17251 or the Lurgan Township Lions Club, P.O. Box 91, Roxbury, PA 17251.